A pair recent Sony patent applications reveal what is clearly an Alpha-system DSLR with a touchscreen display that is functional with both the standard grip and a vertical accessory grip. (See US Patent Appl. Nos. 2010/0134676 and 2010/0134433.) According to the patent application, the challenge with integrating a touchscreen on a DSLR is keeping your nose from activating it when looking through the viewfinder, while at the same time allowing you to access features mapped to the touchscreen controls. Why would you want to use a touchscreen when your eye is looking through the viewfinder? I don’t know. Seems a little odd to me, but Sony thought well enough of the idea to file a couple of patent applications for such an implementation. The touch panel 332 functions as a touched position detector that detects the touched position where the user touches the display screen 33f of the rear monitor 33, whereby a user’s operation can be inputted. As you can see in the above diagrams, the touch-sensitive area is found along the right side of the rear LCD screen, which is still within reach of the right-hand thumb even when looking through the viewfinder. 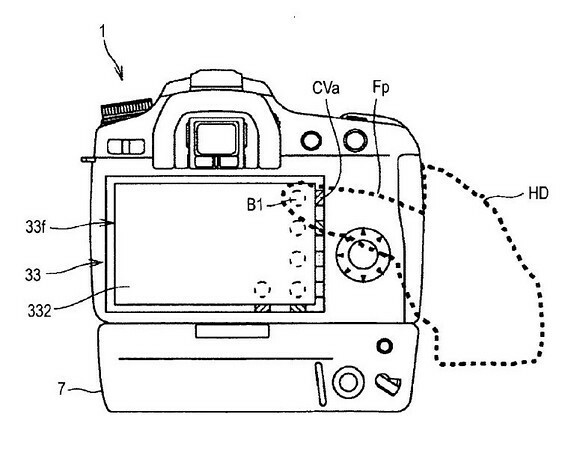 This is not the first touchscreen DSLR for which we’ve seen a patent application. Just a few months ago, a Canon patent application for a touchscreen DSLR surfaced (…and Canon should really look into contracting Sony’s artist for their next batch of patent sketches). No doubt, touchscreen DSLRs are coming. It’s only a matter of time. Who will be the first to bring one to the market? One thing’s for sure – Sony already has great touchscreen technology in their Cyber-shot cameras. The Cyber-shot TX7 has an excellent touchscreen control interface. If Sony’s Alpha-series of DSLRs picked up the same quality implementation as found in the likes of the TX7 and TX5, it could be a solid hit for Sony’s growing DSLR line. In fact, a touchscreen DSLR (from Sony, Canon or anyone else) is one thing that I wouldn’t be surprised at all to see at Photokina 2010. What do you think about touchscreens on DSLRs? Would you use it? How about Sony’s design as shown in these patent applications? Do you love it, hate it, or simply indifferent? The Lumix G2 DSLR already has touchscreen technology. ….and it;s out of the way of the nose……. 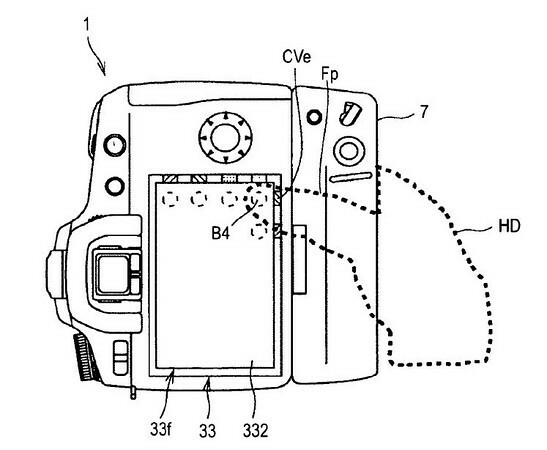 :>D For Sony to apply for patents suggests the functions are quite different from the Lumix design. In either case I wonder how long the screen surface will last after being constantly subjected to the abrasive, oily, sweaty, dirty finger/thumb tip assaults on it’s finish. I prefer knobs and dials too. The touch screen control technique would work fine in Live View mode, but not when using the viewfinder, of course. I’m not sure at all that we need this feature on serious cameras, but people seem to get a kick out of them on digicams.